Entertainment Weekly reports that DC is re-launching and modernizing a number of Hanna Barbera titles starting this May. While the article includes pictures of rebooted Johnny Quest, Space Ghost, Flintstones (how do you modernize the Flintstones, by the way? ), and Wacky Race Land, all of our energy should be focused on that picture above. That’s Jim Lee taking on the Scooby Gang in the most awesome thing you’ve seen today. May can’t come soon enough! A movie about the future is headed to theaters, and we hope this one avoids the trend of dystopian wastelands. 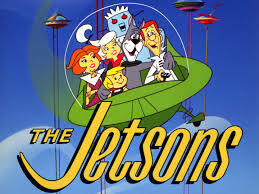 Especially since it is a Jetsons feature film.